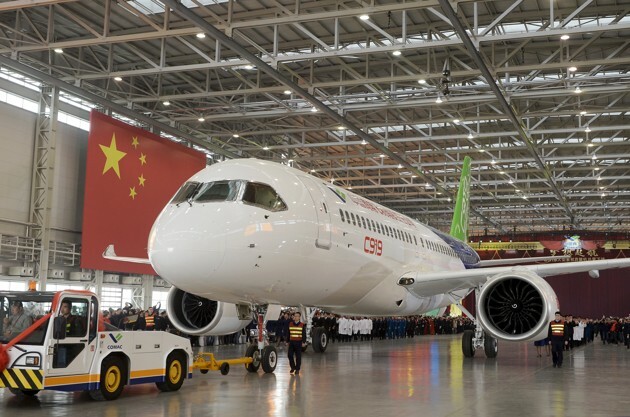 China has rolled its first homegrown large passenger jet off the production line in Shanghai, vowing to challenge the dominance of Airbus and Boeing in the global commercial aviation market. At the ceremony, a shiny C919, sporting a largely white fuselage with a blue wavy stripe and a green tail, was towed beneath a banner with the phrase “a dream takes off” and past a huge Chinese national flag. The C919 — a twin-engine, narrow-body aircraft seating up to 174 people — is similar in size to the Airbus 320 and Boeing 737 series of jets, long the workhorses for airlines around the world. With a flying range of up to 5,555 kilometers (3,451 miles), it is designed to compete head-to-head with its Airbus and Boeing rivals, and said to easily cover popular business and leisure routes from China such as Shanghai to Singapore and Beijing to Bangkok. 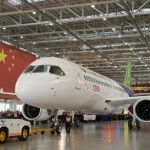 Launched in 2008, the C919 project marks China’s return to the business of making large passenger jetliners, after a failed attempt in the 1980s. Although the C919’s maiden flight is at least a year away, its manufacturer, the state-owned Commercial Aircraft Corporation of China (Comac), has already made no secret of its future plans to make another, wide-body airliner.